Buy one Citroen - get one free | What Car? A garage on the Iasle of Wight is the latest dealer to have a buy-one-get-one-free offer to drum up sales customers who buy a Citroen C4 Picasso Lounge will also get a free Citroen C1 Vibe. The deal is available only from Roger Sixsmith's dealership in Newport, as it is not an official Citroen promotion. However, we would urge buyers to consider how much they want the free car before taking advantage of this, or similar, offers. Our Target Price research suggests that the C4 Picasso Lounge's list price of 23,995 should be negotiable by at least 4000 in the current climate. 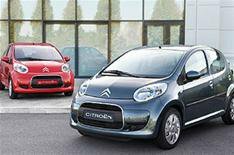 The C1 Vibe retails at 7386, but once it has been driven off the forecourt it is likely to be worth around just 5000.